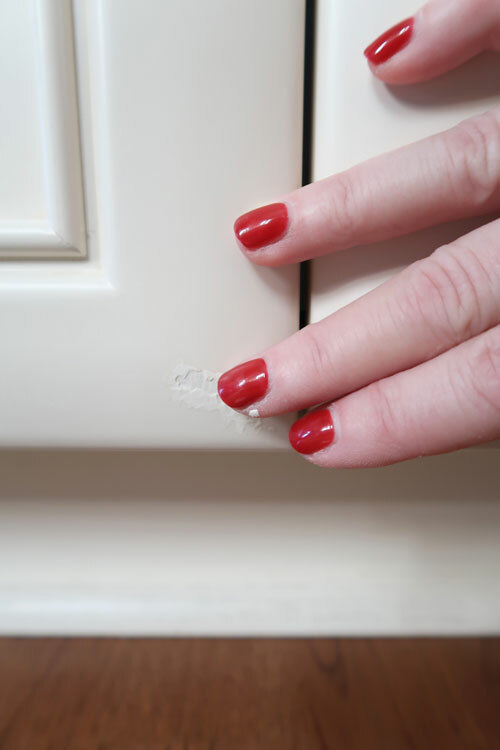 You are here: Home / Paint Projects / Kitchen Cabinets Chipped or Baseboards Peeling? Here’s What to Do! 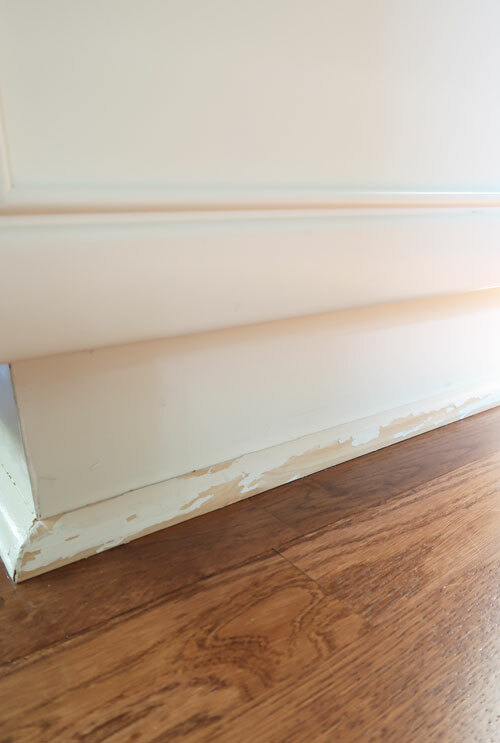 Kitchen baseboards take a beating everyday from your feet and the vacuum cleaner. 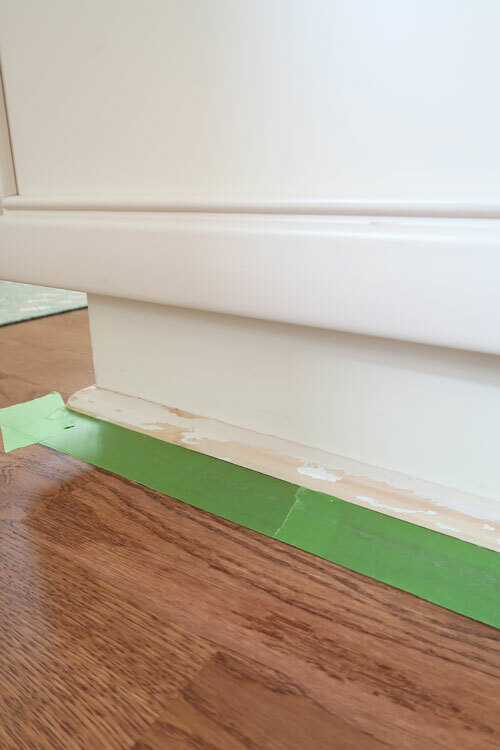 Here’s how to fix scuffed or peeling baseboards and chipped cabinets with paint that matches! Do you live in a house with factory painted cabinets and need to fix either a chip or scuffed and peeling baseboards, but don’t own the paint that matches? 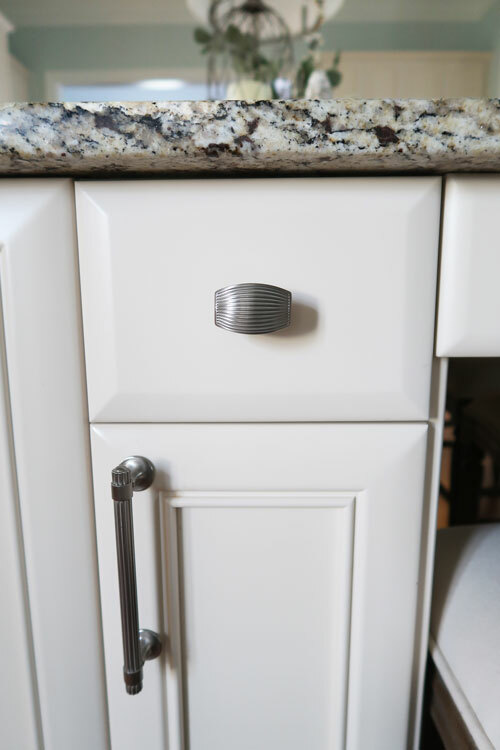 I’ve found a solution that involves a custom tinted paint to match your cabinets that will fix those unsightly blemishes. Guess what? 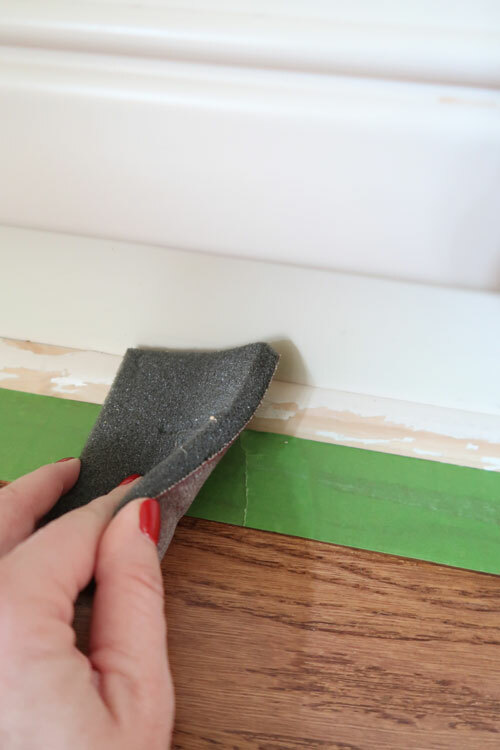 This solution only costs $5 and is an easy DIY fix that makes your baseboards look brand new and hides chips in your cabinets. 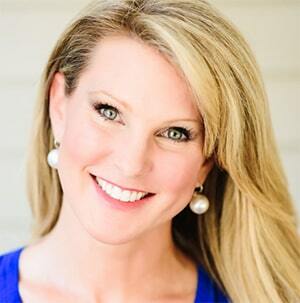 If you are selling a home, this is a must read to get your kitchen looking it’s best! 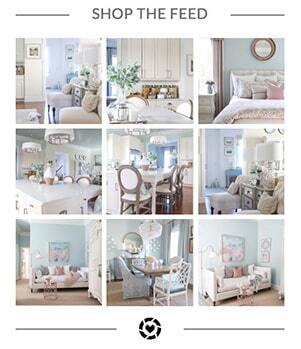 Did you know you can have Lowe’s Home Improvement stores custom match a paint color? Cool right? 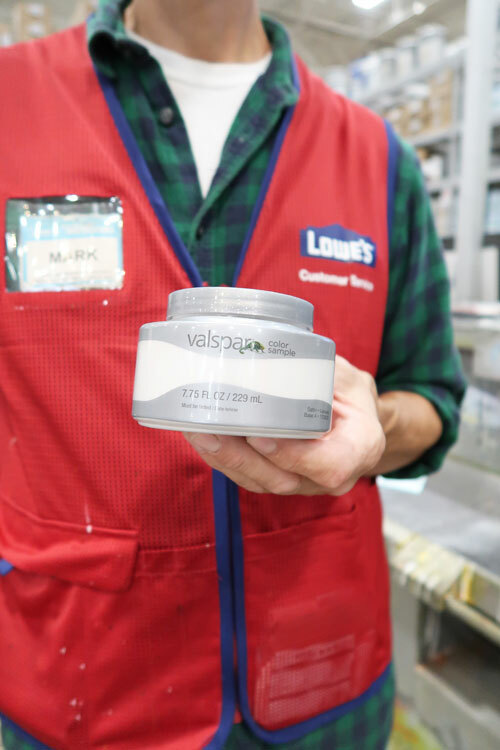 If you are new to my blog, I worked at Valspar and with Lowe’s for 5 years and have some expertise in paint! I’m going to walk you through the process I used to have paint tinted to match my cabinets. The color match is EXACT! The sample created for all of my touch-ups was on sale for $3.98. Pretty affordable fix right? 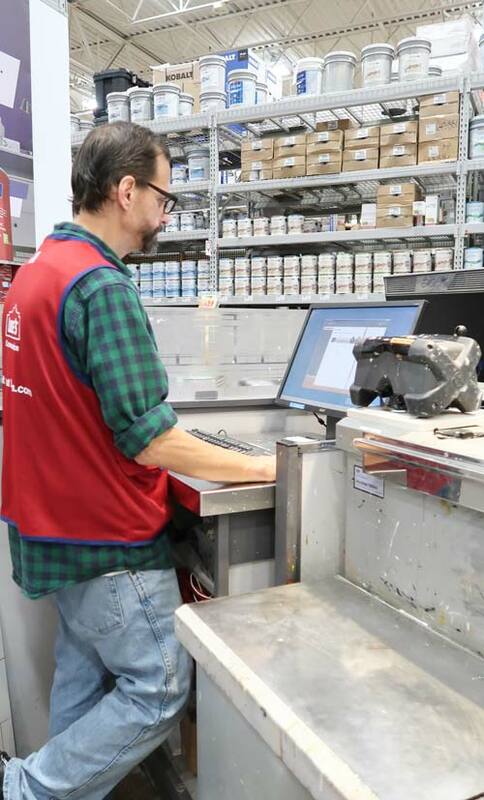 Luckily, I have a friend behind the paint counter at my local Lowe’s store. Mark saved my rear, when an executive at Lowe’s wanted an exterior stain custom tinted to match an old stain. Do you know how hard that is??? He nailed it using his own coloring abilities – not a machine. Mark is now my go to whenever I need color tinting advice! So after years of working together, he was nice enough to let me document the custom tinting process so I can teach you how it works! For a kitchen, the best item to bring in for color matching is a cabinet drawer front or cabinet door. I removed the smallest drawer front I have and took it to Lowe’s. 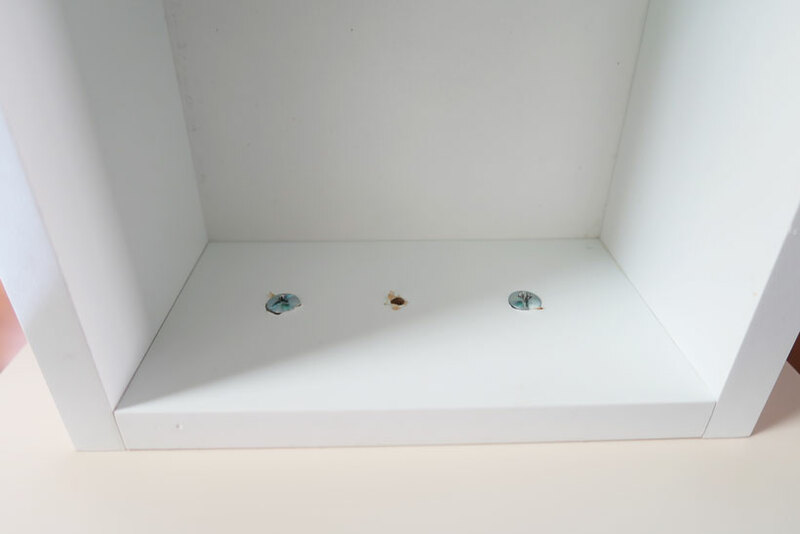 If you didn’t know, all you need to do is remove the drawer front is remove the cabinet knob or pull and then two screws that hold to drawer front to the frame. Easy! If you want to know about installing hardware, CLICK HERE. I have a whole tutorial! Literally, this takes about 60 seconds! 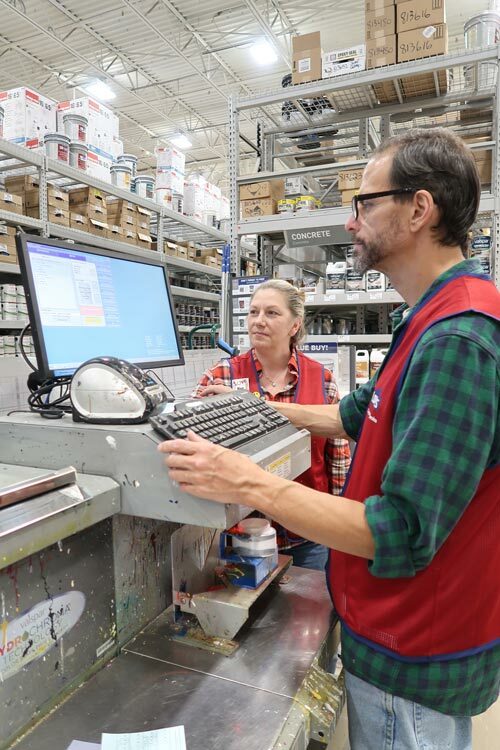 Hand the item you need matched to the Lowe’s paint desk associate and they will do the rest for you! All you have to tell them is that you want a sample and the sheen you are matching. Choosing SATIN is a safe bet for most kitchen cabinets and the Valspar samples come in satin as a standard. Then they transfer the formula to the tinter and make up your paint sample. Easy right? This is REALLY important! 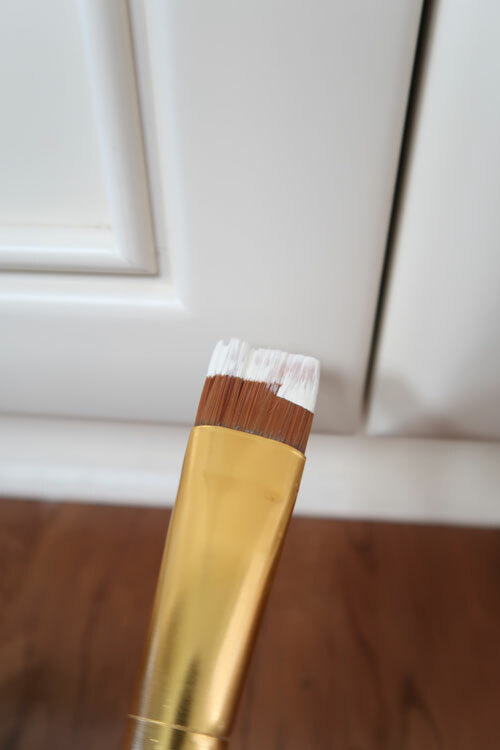 Do not brush on this paint sample to the face of your cabinets! The color will match, but the sheen most likely won’t and you will be able to see the touched up area. 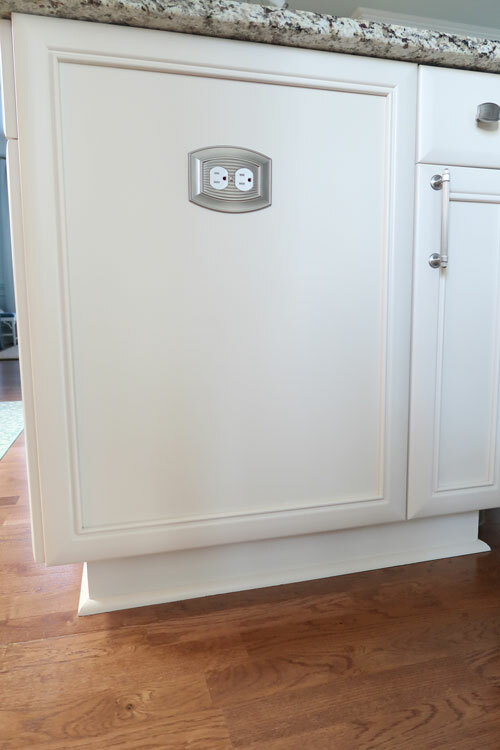 Why it works for the baseboard area is because it is under the cabinets and a small area, so you can paint the entire piece. 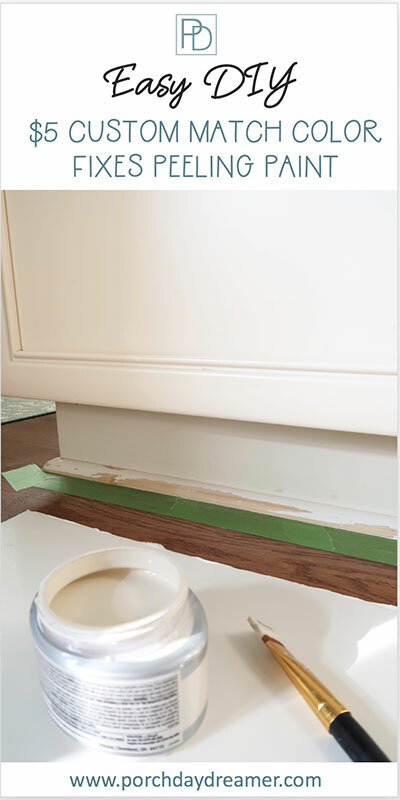 When the baseboard and moulding is fully painted you won’t see the sheen differences. For chips, apply as I’ve shown below so you are just filling in the chip itself. You MUST clean the cabinet thoroughly and remove all traces of dust and dirt before beginning. I typically will only use a Norwex cloth and water, which has worked well for me. 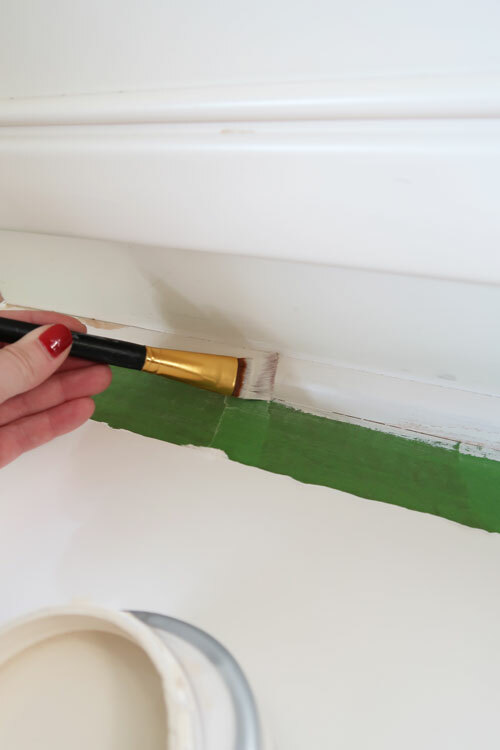 Using a small craft brush, tap paint only into area that has been chipped. Take your finger and lightly remove paint from outer edges. I keep baby wipes on hand to wipe the paint off of my fingers. To get the best coverage, REPEAT this process every half hour 3 times. In between application, store your paint brush wrapped in plastic wrap in the refrigerator. This is the next morning after both the chipped areas had been repaired and a preview of what the baseboard touch-up achieves (instructions below). It all now looks so fresh and clean! 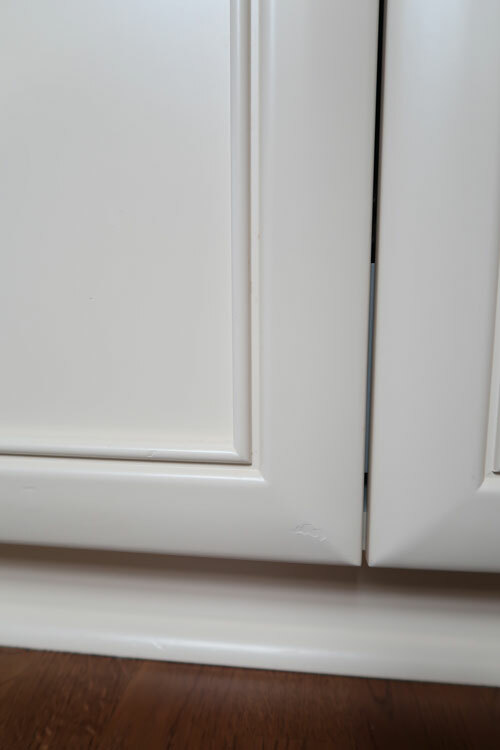 You can see that the chipped areas are still visible, but now blend in with the rest of the cabinet. Using a wood filler to build the area is possible, but I would be concerned about sanding it smooth creating a larger area to touch up. Then the sheen difference would be obvious, where here it isn’t. This is where my sweet dog Mick’s dog bowls are, and they have done a number on my baseboards. The constant splashing of water throughout 4 years of filling his bowl weakened the paint. Latex paint is made with water, so it gets weak over time if it is constantly exposed to water. It was really becoming a problem every time that area was cleaned because more and more paint started to flake off. I was worried it was going to end up in the food or water, so this HAD to be fixed for my dog’s safety. Vacuum up loose particles and thoroughly clean area to be painted with a Norwex cloth and water. Tape off floor below quarter round moulding. 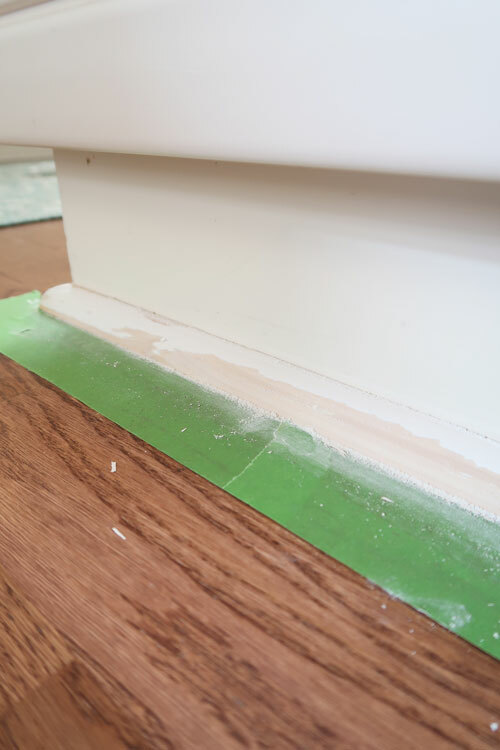 Work to slide Frog Tape under the moulding to prevent paint from getting on the floor. With a sanding sponge, roll it over and just sand the quarter round moulding. 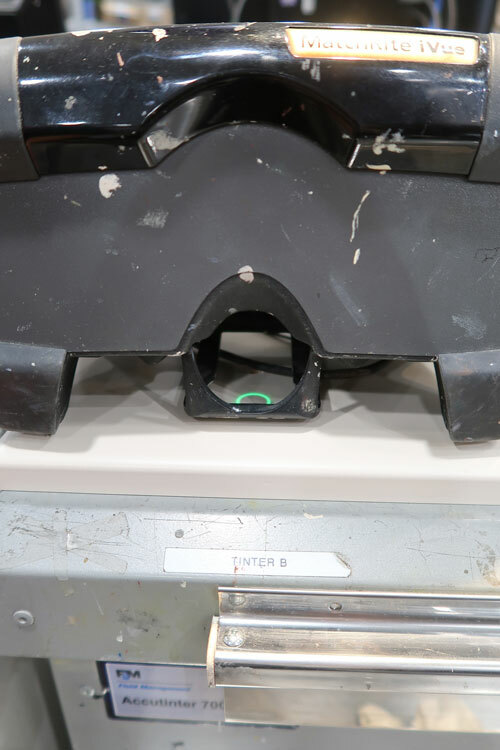 Make sure all loose and chip paint is sanded smooth. AVOID SANDING THE FLOOR! 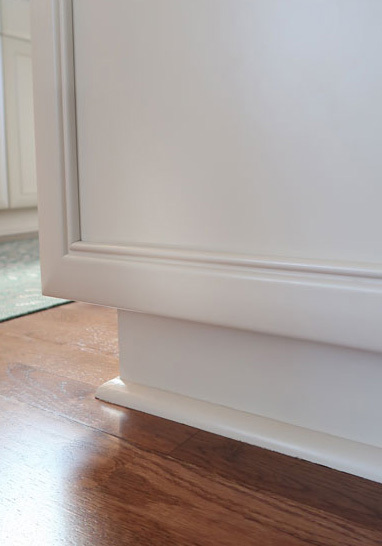 Lightly sand the baseboards below the cabinets. Vacuum up all loose particles and wipe the area clean, so it is dust free. 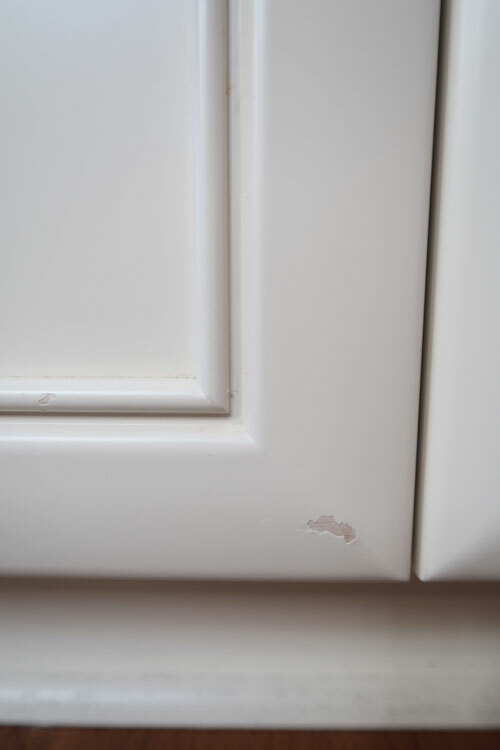 As a note, I also applied the touch up paint in the grooved area of my cabinet to cover up the chip you see above. It was safe to do this because the sheen difference will be hidden by the groove. 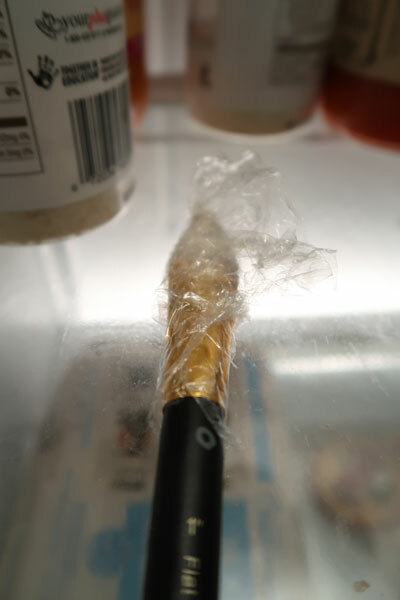 Let paint dry about an hour – store your paint brush in the refrigerator (as I showed above) wrapped in plastic wrap. Apply 2nd coat of paint. Remember that wet paint is LIGHTER while it is drying. You can see in the picture above where the paint started to dry and where it is wet. Even this early I couldn’t BELIEVE what a dead match the paint sample was! Here is a picture of the finished result after drying overnight. The color match was PERFECT! You can’t tell I repainted under the cabinets. Boy does it looks SO much better. There is something about a fresh coat of paint that just feels good and clean! 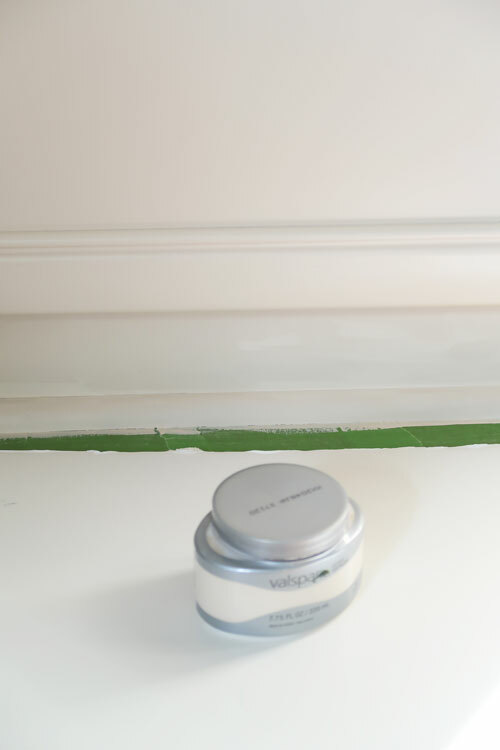 Seeing the results I was able to achieve in this small area, I’ll be applying paint to all of the baseboards in my kitchen for a fresh new look. This is a quick fix friends. Let’s be real this is not how I would EVER paint cabinets, but this works in this small area to solve a problem. 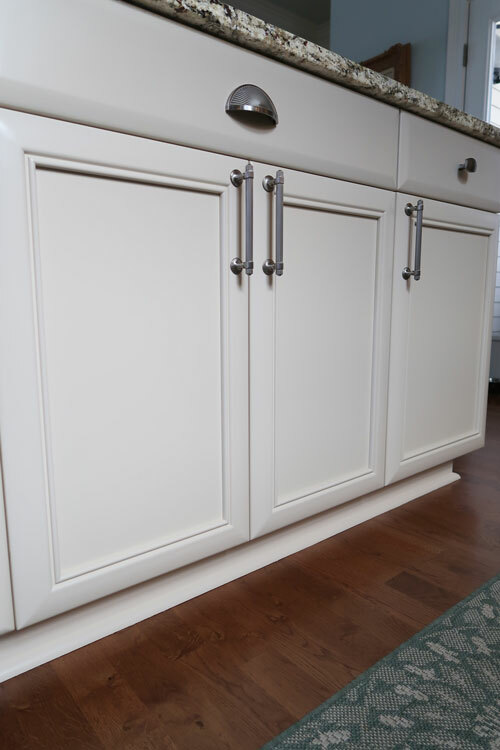 If you want to know how to paint ALL of your cabinets – even over stain, please READ THIS POST. I’m going to keep the paint sample handy for any future blemishes that develop and maintain the baseboards from time to time. The satin paint used can be easily wiped down and I expect will hold up well over time. Paint is not permanent, so I have realistic expectations that the paint may peel at some point and I’ll have to follow this process all over again. The good news? It’s a cheap and easy fix! To see more of my budget saving paint projects, CLICK HERE or please consider signing up for my weekly email newsletter so you don’t miss a tip or trick! fix them. Also, love the countertops you have with your blue cabinets . Are those marble? Hi Tracy. Thanks for the tips on the chipped and peeling cabinets. I have white cabinets from Kraftmaid that were purchased from Lowe’s. Some peeling around the edges by the sink and dishwasher. I know what you mean about the nice factory finish on them. The peeling is around the top of the doors. Thanks for the tips. Happy Thanksgiving! Lynn, exactly! I had that issue too under the sink because of the water dripping. Since this post, I’ve touched up that section too. I’m working my way around my kitchen 🙂 Glad I could help and Happy Thanksgiving! What about wallpaper? Got beige striped wallpaper and it got knicked on the corner. Wouldn’t take much to fix and yet a painter was going to charge me $50 and said forget it…….the rest of the bath is fine so hate to take the paper down because of this knick…. thoughts? Thank you! Sorry, I’ve never wallpapered other than peel and stick once. Don’t have any advice or trick for that!